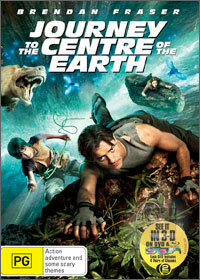 Journey to the Centre of the Earth is a modern day twist on the classic Jules Verne novel of the same name. Trevor Anderson (Brendan Fraser) is a volcanologist struggling to continue his research after his brother and fellow volcanologist Max mysteriously disappeared 10 years prior on a expedition. With only a few days left before the university closes his lab forever, Trevor returns home to discover his Nephew Sean (Josh Hutcherson) expecting to stay for the holidays. With him Sean has a box of his father's possessions including his copy of the novel 'Journey to the Centre of the Earth'. Browsing the novel with which they were so obsessed with as children, Trevor discovers notations from Max about volcanic readings which bare a uncanny resemblance to his current volcanic readings. Deciding to investigate this anomaly Trevor soon realises that the notations are directing him to meet a professor in Iceland, the place Max presumed to contain the gateway to the centre of the Earth. Upon landing they find that the professor has since passed but his daughter Hannah Asgiersson (Anita Briem), a mountain guide who explains that Max and her father where' Vernians', people who believe the works of Jules Verne to be fact, a belief she is very pessimistic towards. Regardless she is willing to show them the way to the source of the volcanic readings. As they reach the peak of the volcano a freak lightning storm forces them through a dilapidated mining tunnel and onto a world within another world. With prehistoric creatures roaming, vast plains of barren desert meeting dense forest it's a place like no other. But before the three can enjoy the mystics of a land so foreign they are hit with the realisation that their stay is heating up, and if they don't find a way to reach the surface within 48 hours, They won't make it out alive. This fresh take on a classic tale is a great journey that will spark children's imaginations and interest due to its outlandish CGI action sequences and fast paced settings. There are quite a few plots holes throughout the story, but due to the speed of the sequences you forget most of them in a need to keep up with the story line. Some elements also contain 'tacky' special effects when watched on the standard definition disk, the novelty of this DVD is the featuring of a 3-D disk and accompanying Red/Blue glasses to bring the story to life. The 3-D element will wipe away the obvious under polished CGI effects but does nothing in capturing the full cinema experience. Luckily the Audio has picked up some of that slack with a crisp Dolby 5.1 soundtrack creating a much fuller experience and certainly becomes a tremendous feature during the caving scenes. Brendan Fraser is perfectly at home in this role with the majority of his careers work in this exact niche, with Hutcherson and Briem taking backing roles to give Fraser more room to bounce his comedy antics off. Children will adore this movie for its wildness, pace, and the 3-D element, some parents may get a little lost in one of the many plot holes, but for them it will be 90 minutes of TV babysitting.